It seems that chefs these days are getting younger and younger, which is what I immediately thought when I met Executive Chef Alexandre Gaudette in the kitchen after having dinner at the restaurant in February 2009. 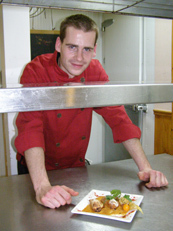 Although young, he is also very talented, energetic, and creative in his approach to French cuisine. He is passionate about cooking and appreciative of the opportunity that Cedric, the owner of L'Avalanche Restaurant Bistro Lounge gave him. After tasting his creations, I knew that it was an inspired match, with Alexandre and Cedric working together with the L'Avalanche team to create an interesting menu and an inviting ambience for the guests. For a chef, Alexandre Gaudette believes that it is important to work at a good restaurant, with a good owner and a good kitchen team, which includes Jovin Degre and Claude Guerette, and to listen to their suggestions. When not creating new recipes, reduction sauces, and infusions, he enjoys listening to the Canadian singer/songwriter/guitarist Dallas Green, and playing his guitar, which as unbelievable as it may seem, he learned to play using the Internet. His goal is to play guitar like Jimi Hendrix and cook like Gordon Ramsey. With his passion and determination, anything is possible. Method: Boil the potatoes and the parsnips. While they are boiling, infuse the heavy cream with garlic and thyme. When the potatoes are tender, drain and set aside. Remove the garlic and thyme from the heavy cream, and then add the cream to the potatoes, along with the honey, and salt and pepper to taste, and mash. Method: Infuse the cream with the mint tea bag, add the fresh raspberries and the raspberry jam, and cook to reduce. Season with pepper to taste. Method: Combine the field berry juice and the raspberry wine vinegar and sugar. Cook to reduce, and then let stand to cool to room temperature. Method: Cut the parsnip, carrot, and zucchini using a mandolin, and cut the leek in vertical strands. Pan roast the vegetables in the duck fat. Method: Grill the chicken breast. Stuff the chicken breast with the goat cheese and coriander, and add salt and pepper to taste. Bake in the oven for 12 minutes. Bon Appétit! 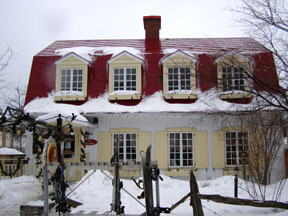 L'Avalanche Restaurant - Bistro Lounge is open daily for dinner as well as for lunch during high season in the winter and summer months. 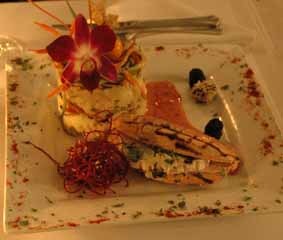 Read about L'Avalanche Restaurant - Bistro Lounge in the Restaurants section.